I am looking at this breed because they made the top ten on the three lists of best dog breeds I was able to research on the net. The information here will be part internet history based, in the field based, and information about them when used as family pets. 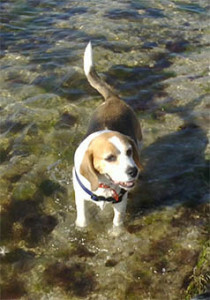 The beagle is known to exists at least back into the 1500s in the UK and 2000 years ago in Ancient Greece. In the UK they were run in packs to hunt & tracking rabbits, hare, pheasant, quail and other small animals. The breed is thought to be a cross between a Harrier and other English hounds. If you research the harrier hound you will see that they look quite similar to the general shape of the beagle. The harrier itself is breed down in size from the English Foxhound. Note the American foxhound and fox terrier dogs are listed on quite a few ‘best hunting dog’ list but not the English foxhound. Beagles were bred to hunt regularly and for long periods of time on each hunt. For this reason over centuries they were bred to have VERY high level of stamina and if not used for hunting (ie as a family pet, they need regular exercise. There are many varieties of dogs that hunt. The beagle is known to be the king of the scent hounds. This means that their nose and ability to smell scents very faintly over long distances is extremely good. And once a scent is obtained, they will only focus on this, to the exclusion of almost all other senses. Some inexperienced hunters will see this as a problem, because once activated, a beagle will do everything to get to the source of the scent. Beagles can be trained, as can any dog, but they need a more dedicated trainer/ owner than many other hunting dogs often require. You may find it strange that I should include a section on beagles used as companinon animals, however as beagles age, not all of them will be kept on the hunt. And of course not all beagles are used for hunting in the first place. It should be obvious from the characteristics described above that beagles can prove very challenging for most domestic situations. An hours yard must be incredibly escape proof, and if a beagle senses something it wants to pursue and cant, it may also provide the kind of bark or braying that everyone in the neighborhood will soon recognize. Due to their extreme stamina, they require regular long walks. And due to their dedication to tracking and finding the source of the prey, very few owners are confident to allow their dogs off lead, even in fenced dog parks. A beautiful very old breed, bred for a single purpose, no wonder many hunters give them such praise.